'This cutting board is designed after the barrels used for distilling wine or for beer. The board can be used for cutting as well as for cheese, which you could enjoy with either drink,' says Teo Hernández. 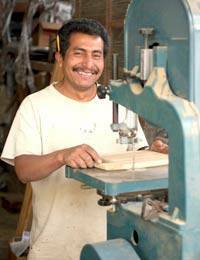 He carves the teakwood board by hand featuring rounded contours and a rounded handle.